Not all probiotics are created equal. Innovite Health starts with the extremely resilient, scientifically validated DDS®-1 Superstrain. With over 35 years of clinical research. Proven to inhibit pathogen activity. Human-sourced. Naturally strong to protect and flourish. No additional pill coatings required. The ultimate probiotic strain. Exclusive life-stage formulas include additional active strains for full spectrum support. Directions of Use: Adults, adolescents, and children 6 years and older: Take 1 capsule daily before or during a meal, or as directed by a healthcare practitioner. Take at least 2-3 hours before or after antibiotics. Refrigerate after opening. Non-Medicinal Ingredients: Rice maltodextrin, hypromellose, fructooligosaccharides, magnesium stearate, silica. Warnings: If you have fever, vomiting, bloody diarrhea or severe abdominal pain, consult a healthcare practitioner prior to use. If symptoms of digestive upset (e.g. diarrhea) occur, worsen, or persist beyond 3 days, discontinue use and consult a health care practitioner. Contraindications: If you have an immune-compromised condition (e.g. AIDS, lymphoma, patients undergoing long-term corticosteroid treatment), do not use this product. Caution: Do not use if the seal is broken. Keep out of reach of children. Store in a cool dry place to preserve freshness. I've tried these and after the first day, I was feeling fine. Second and third days of taking, I started to feel a little ugh feeling. Maybe it was because I took it on an empty stomach? They did help me "go", so there was some good in this. I guess because I normally don't take these or any probiotics, maybe I just need more time. However, these do help/work, so I would recommend them to others. Maybe just take with food. I found this easier to take than other probiotics I've tried in the past. I haven't seen any changes yet, but will keep taking in case it takes longer for my sensitive stomach. I loved these sensitive gi probiotics ! I have a rare abdominal disorder as well as IBS, severe GERD, and diverticulitis. These probiotics helped tremendously with my severe and chronic diarrheal issues even during a very humid heatwave that would usually trigger terrible tummy troubles. Thanks you for the wonderful opportunity to sample these. While I did find the capsules a bit large, it was worth putting up with. 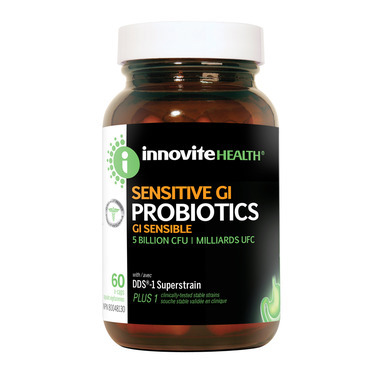 Normally, just about every time I eat, I get sick, but by taking Innovite Health Probiotics Sensitive GI 5 Billion CFU, I've found quite a difference. I don't get sick nearly as often, and, in general feel better. Worked like a charm on my sensitive guts, however, the capsules were a little big for me. After trying so many different probiotics (as per Dr) and failing, I had all but given up. This is the one probiotics that not only did not make my stomach problems worse, but helped immensely. I cannot believe I am able to start eating things again that I had to give up before. I can also start dining in restaurants again without fear that I will have a sudden flare up of my stomach. Absolutely fantastic product. Highly recommend. .